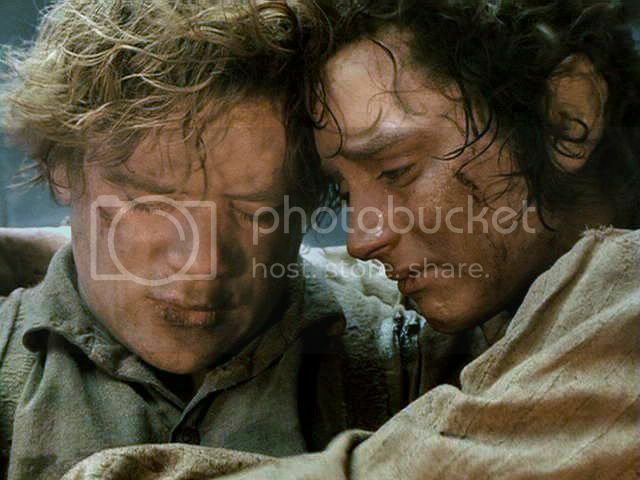 The spectacle of Sam’s grief calls Frodo to action. 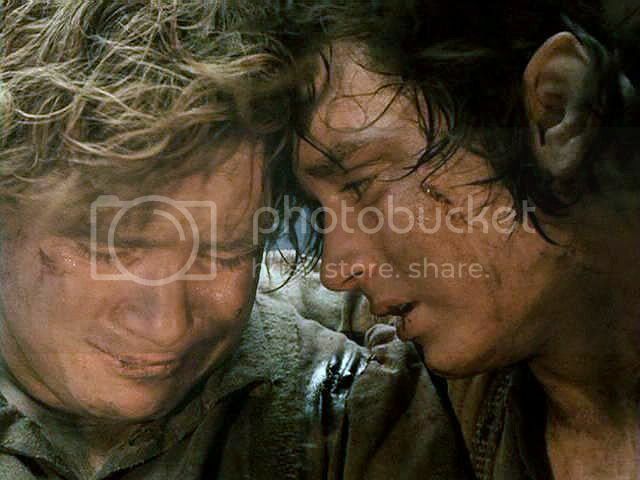 He pulls himself up and goes to sit by Sam, now openly weeping. 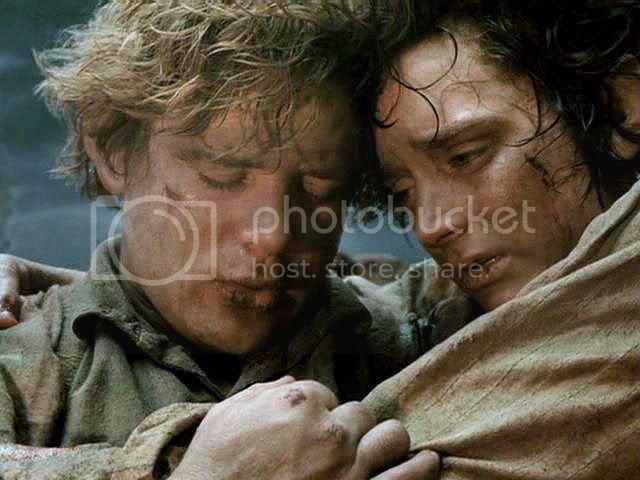 Frodo gathers him in with an arm and leans close. 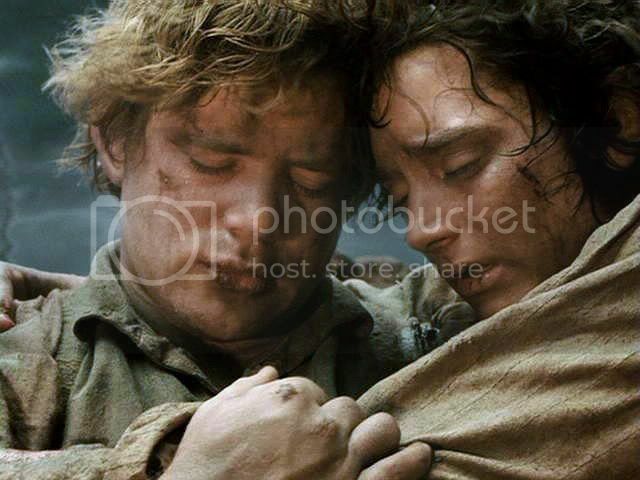 First Frodo just holds Sam, saying nothing. 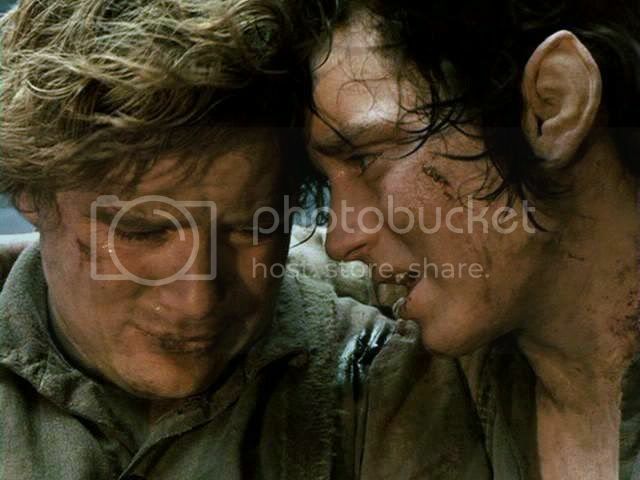 He tries to engage Sam’s eye, but Sam won’t look. 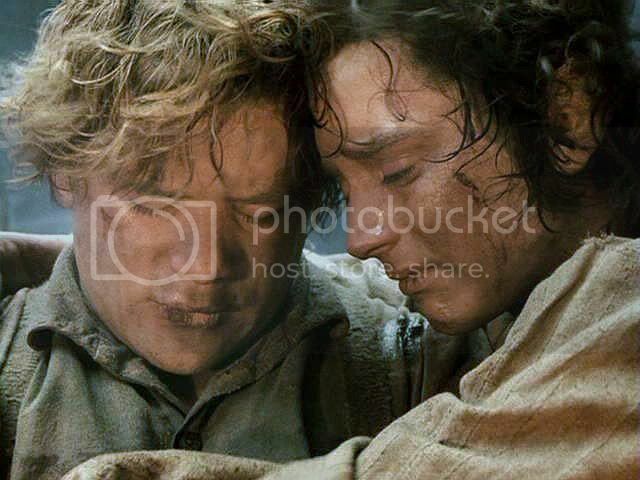 Wrapping his other arm around Sam, their foreheads together, Frodo rocks them both as if they might in that way be gentled into the death they both expect. What the heck! The posts screwed up! Whaaah! Where are the other parts??? I'll be back. Thank you, Mews, for you lovely comments. They make me very happy. I did notice the links for going on to the next page did not work after I had first posted. I went back and did a little tweaking (they looked fine, really! ), and they seemed then to work. Do they still not work? Let me know if they don't. They do when I try them from my own journal. Oh wow: absolutely stunning screencaps, Mechtild. This whole sequence broke my heart, in a good way. It also helped me forgive PJ some of the heresies he committed!! 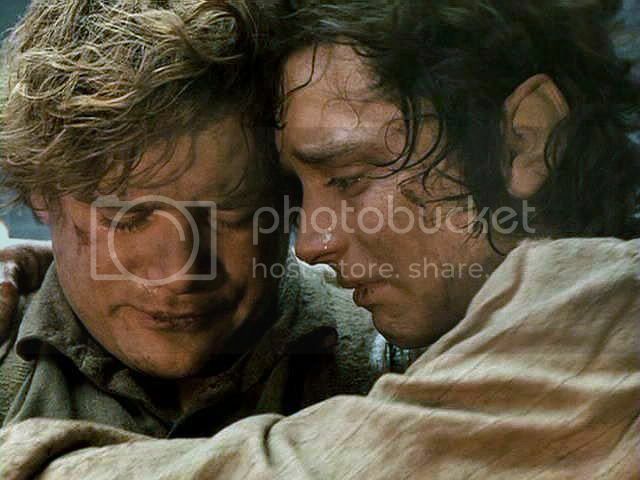 I'm glad that here we see Frodo comforting Sam. He also looks, here, as mature as Sam. Poor Sam. 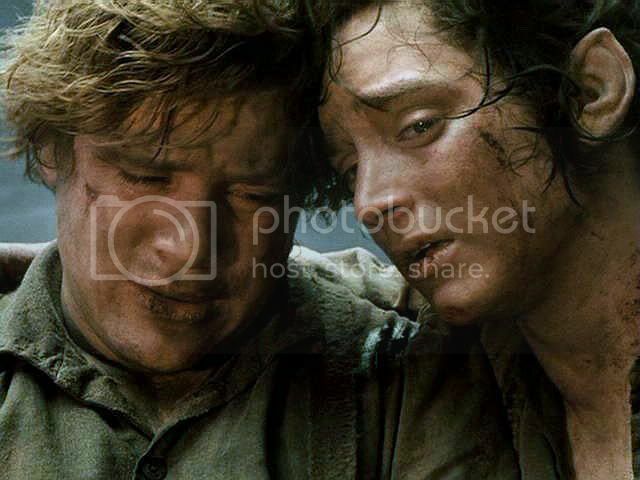 How exhausted and grief-stricken he looks. 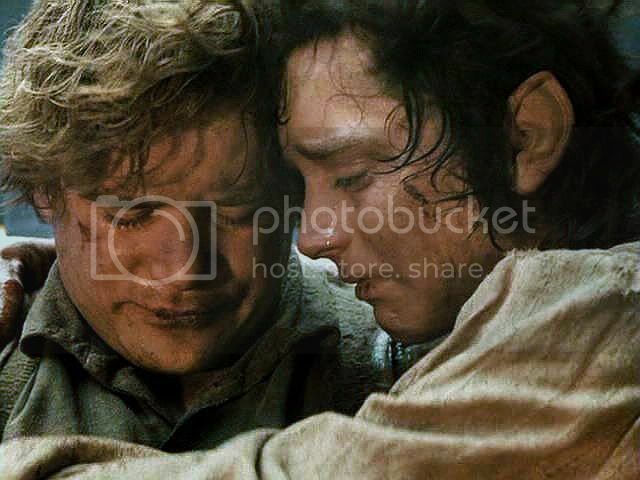 But it's Frodo comforting HIM. 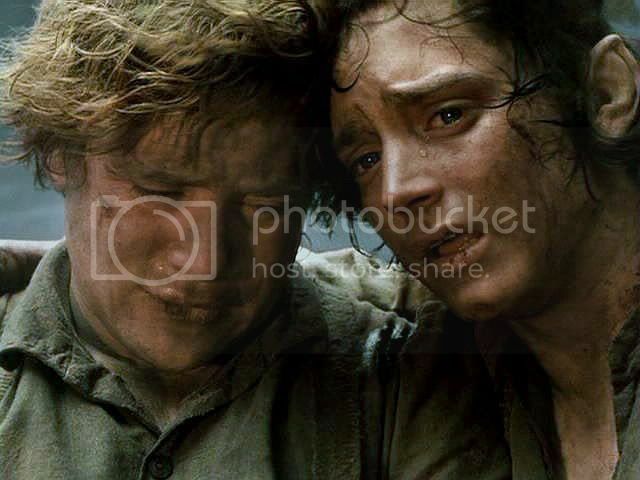 Frodo, clearly so relieved now that the dreadful burden of the Ring has gone. 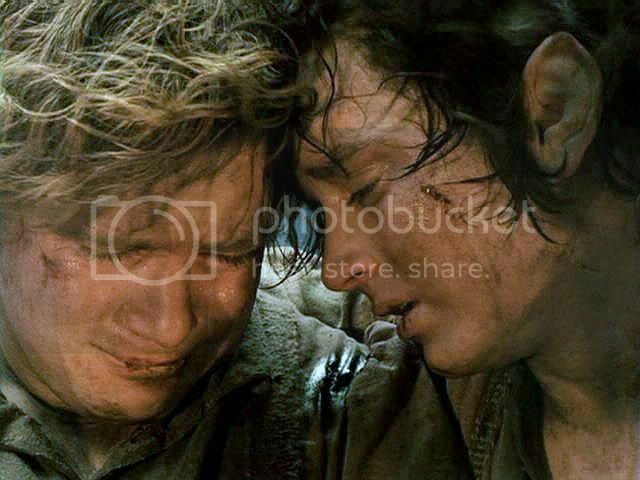 For a few moments, that sheer relief shuts out the despair of their situation - that they are doomed to die a fiery death on the slopes of Mount Doom. 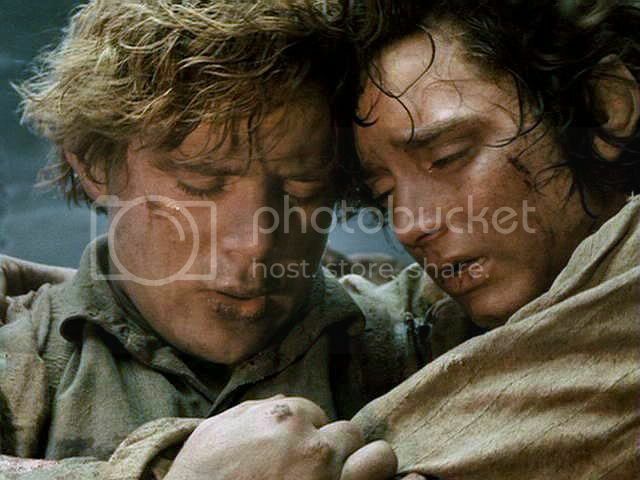 It is just sublimely beautiful ... the depth of devotion and love between the two hobbits, as they try to shut out their impending death. Yes, this scene makes up for very, very much. 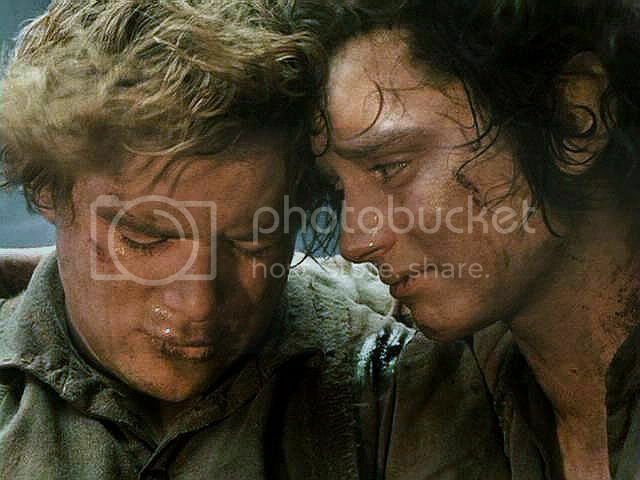 But, really, if we can let go of the trilogy's downfalls, there was so much that was wonderful and sublime and gut -and-bone true in them, I still don't know how they can be surpassed as film story-telling at a very high level. I saw a thread, browsing TORc for the first time in months, started by a poster remarking that watching the films was a bore and a trial to him now. Well, I do not share that view, although I have been refraining for months from any re-watching, since I really have watched all of the films A LOT. 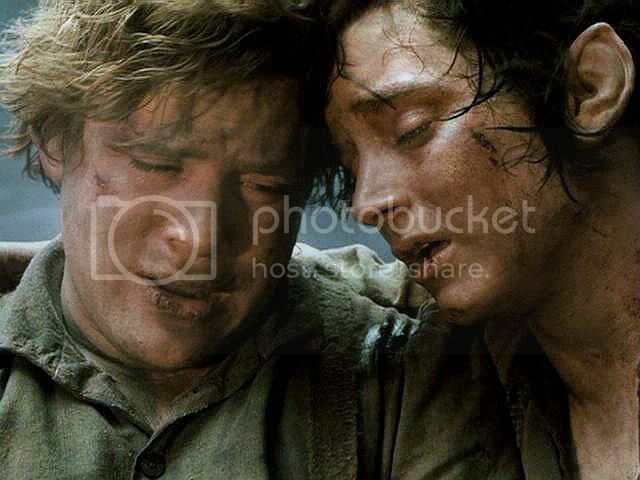 The spectacle of Sam’s grief calls Frodo to action. 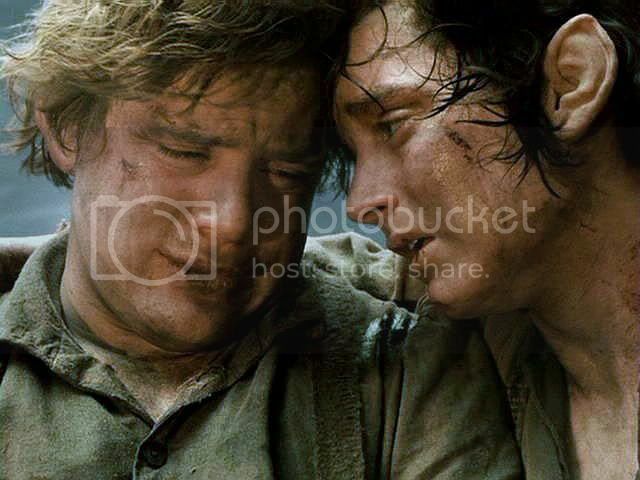 Frodo rocks them both as if they might in that way be gentled into the death they both expect. 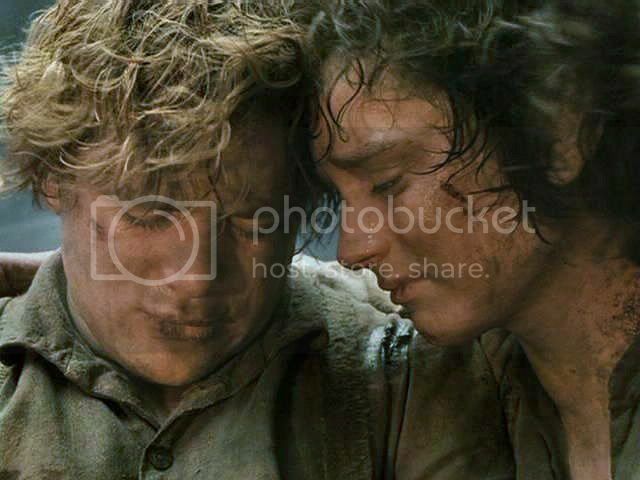 Oh my, that's a hundred times more heartbreaking in screencaps! 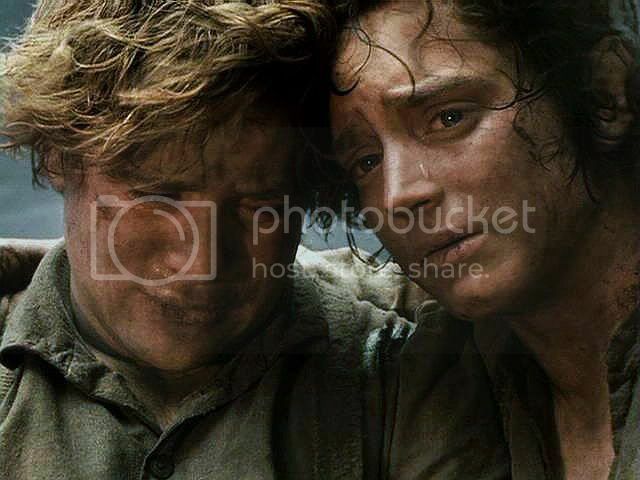 What an unbelievably moving scene. Gah -- so beautiful! You almost made me cry. I had to make this icon back when screencaps first started appearing, because he's just so... Well, you know. Bunniewabbit, without appearing terribly rude, do I know you under another name, say, at a messageboard? It really is moving, isn't it Este? Play the soundtrack at the same time. You'll have to be taken away on a stretcher. God this is so sweet. 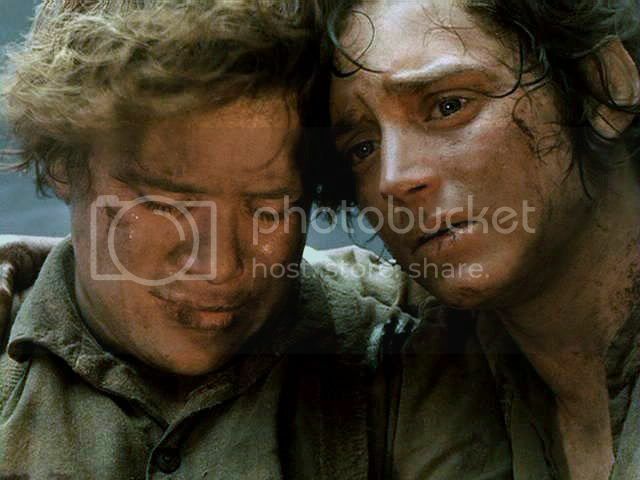 Frodo and Sam boiled down to their essence. 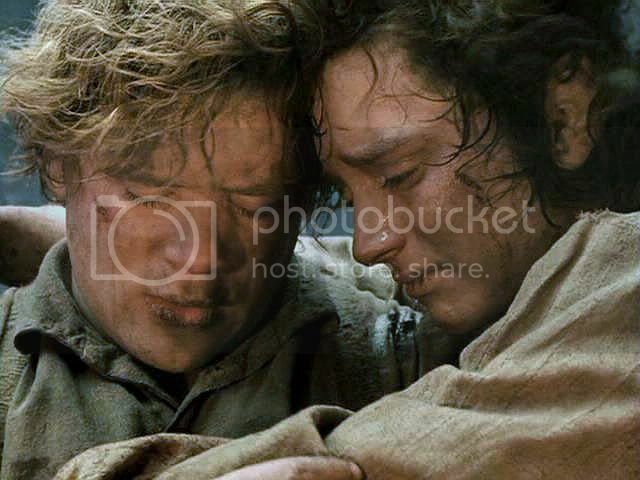 True freindship. (How I envy that!) 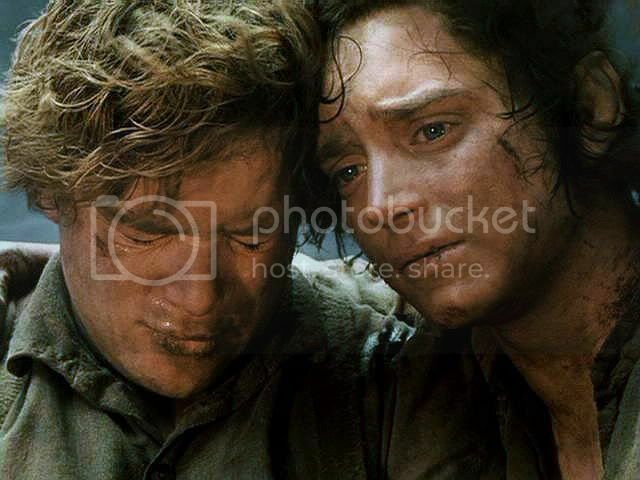 Frodo, strong and comforting and looking at death with acceptance and Sam so desperately wanting more life that he just can't bear it. 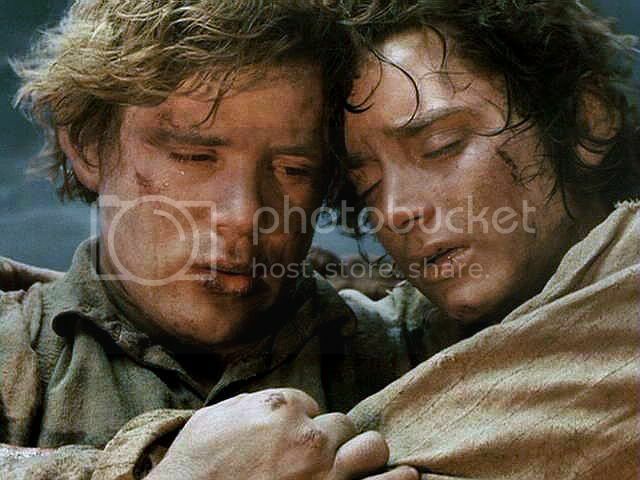 You can see in this sequence Frodo's strength encompassing Sam and bearing him up and Sam letting go and surrendering to it. 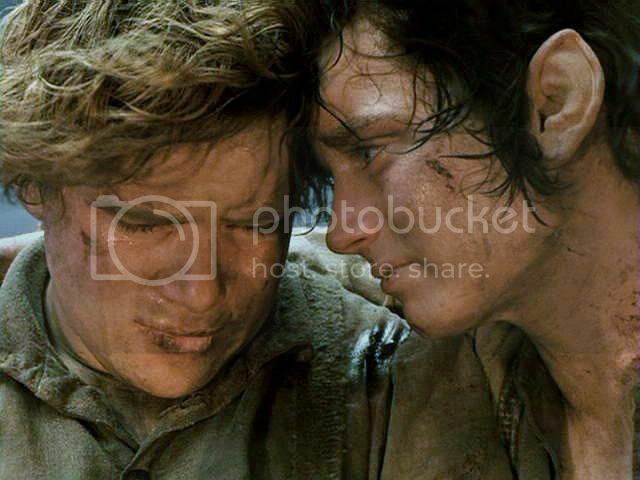 These two actors are just the best. They both should have won every award possible. Ha! I await its unveiling in one of your fine illustrations, Taerie! Thank you for sharing all of these screen caps, Mechtild. So, so heartbreakingly beautiful. 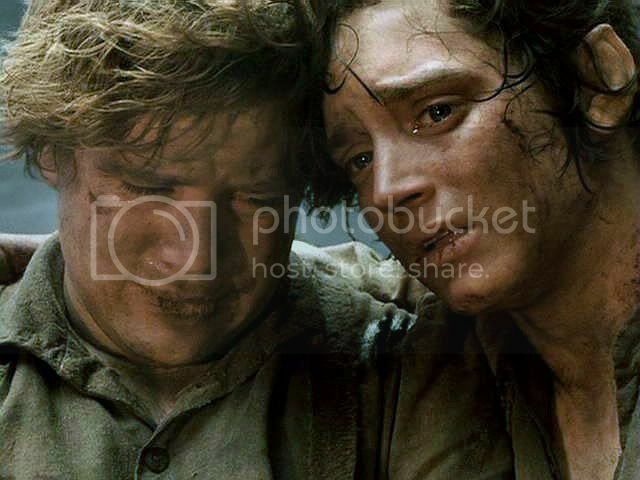 Now, doesn't this make you want to go and see Frodo's actor in person....? Ho-HO, do I remember that image by Green Ghost. As soon as I saw those little pubic hairs she added I was in love. I adore a pretty, curling thatch of pubic hair. I am sorry it is the fashion now to remove it, in Europe, any way. It always betokened sexuality to me, instantly. "Wow! I can see his/her pubic hair peeking out!" Looking at a good patch of it also makes me think EVERY TIME of the scene in "Lady Chatterly's Lover" when the Connie's gamekeeper lover threads wildflowers through hers, making up little bits of rustic verse. I thought it was silly, charming and utterly romantic all at the same time. And, had her mons been bare, he would not have done it. What a pity that would have been! So, the moral is: all women should hang on to their nether curls, just in case they are running about naked in early summer through a flowery meadow, in the company of a bold and imaginative lover.